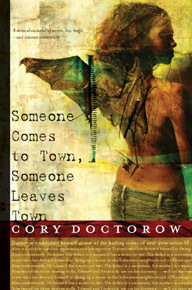 I’m reading Cory Doctorow‘s latest novel, Someone Comes to Town, Someone Leaves Town. Actually I’m reading it on my Palm: I downloaded the plain text, used DropBook to convert it to Palm Reader format, & synched it up with my Palm. I’m reading it on the bus, mostly. And it’s amazing to me how little reading I can actually get done on the bus, because people keep asking me what I’m doing. Like they’ve never seen a Palm before. Just yesterday morning one of the regular members of what I’ve come to think of as the G bus kaffeeklatsch asked me if I was checking my calendar for the day, & when I said no, I’m reading a novel, he goggled at me in disbelief. Asked me if I was kidding. No, I’m really not kidding. How do you get a novel onto that thing? How much memory does it have? You mean you have more than one novel on that? Yes, and PDFs of journal articles. Yes, really. And so I have to ask: Why is the idea of reading on a screen still so weird for most people? It’s not like text on screen is anything new. I mean, PCs have been in the home since what, 1982? Ok, in 1982 it was amber-on-black, not exactly nice for reading. But the PDF format has been around since, what, 1996 at least, and the whole point of PDF is to exactly replicate the look of a printed page. People have had 10 years to get used to the idea of reading on screen, and they haven’t. Why not? I suppose this question probably touches on usability, the failure of e-book readers to take off, I don’t know what all other issues besides. I don’t have an answer for any of this; it’s a mystery to me. I’m giving these books away to sell more books, to find out more about the market and to increase my profile so that I can land speaking and columnist gigs. Not because I’m some patchouli-scented, fuzzy-headed, “information wants to be free” info-hippie. I’m at it because I want to fill my bathtub with money and rub my hands and laugh and laugh and laugh. He makes a compelling case that giving it away for free increases his sales: 5 printings of Down and Out in the Magic Kingdom. But an alternative explanation could be that he’s just a good and popular writer. I, for one, would like to see some actual data on the effect of the existence of electronic versions on the sale of physical media; the impact that different market factors have on sales. A study that isn’t sponsored by the RIAA or MPAA. A study with controls: compare print works with free electronic versions, to print works that sell electronic versions for as much or more or less than the print. Compare the sales of works under copyright to the sales of works out of copyright, such as titles held by Project Gutenberg. Compare the sales of first and subsequent printings. And that’s just looking at print, not even music or video. Will someone please do a study like this? The results will either vindicate or refute the RIAA, the MPAA, the AAP. I know which way I believe it would go. I’m totally with you on this one — I don’t understand the hangup with reading on-screen. I always have my PDA with me, so having my current reading there makes it so much more convenient for me to get some reading done wherever I find myself — even places where there’s little ambient light. I read Doctorow’s previous novel, _Eastern Standard Tribe_, on my Treo 300. Since then, my Treo died, but my job ended up getting me a Dell Axim, so right now, I’m reading Cervantes’ _Don Quijote_ on it. Quijote is a work that’s awfully imposing to carry around in dead-tree form, but fits very nicely on a PDA — and the display in Microsoft Reader on my Axim is so bright, clear and comfortable to read. All those folks that think ebooks will never take off because you can’t curl up in bed with a computer — nonsense. You just haven’t tried it this way yet. but until then I’m going to be holding onto that little bit of nostalgia from my youth. I don’t want to sound old, but I don’t think I can say this without starting off, “When I was a boy” I always carried a book, or two or three in my gigantic oversized backpack wherever I went. When it rained I’d bring a plastic bag with me so the book wouldn’t get soaked. When I was done with the book I’d put it in a box or if I really liked it on a bookshelf, where every once in a while my eyes would pass by it and I’d think to myself, “Wof that was a great book I should read that again, and sometimes I did. I know that e-books are the way of the future, but there is that little voice in the back of my head that wonders if books will one day wind up like music. You fit around 40 Gigs of music on a mp3 player and then forget about it. You wouldn’t have time to listen to every one of those songs, and then you’d spend so much time going through and deleting the ones you didn’t like. I don’t want to do that with the books I read. (I know there is an opposite to that, where people, will be able to download hundreds of books that thye’ll really enjoy, pay less, and enjoy them all, but I’ll let somebody else argue that point) Still I’ll probably be the first in the line when my favortie author starts doing e-books only to plop down my credit card number and download a good read.